Sturdy Frame- Mesa is the latest expansion from our successful curved pop-up system NEO. It has adopted the same strong boxed aluminium silver frame. Uni Hanging Strip- This uni hanging strip let you to have one single graphic wrapped around your favourite counter. The header is also equipped with our unique floating magnetic hooks, which allows you to adjust the graphic position to the best. Environmental Friendly- Both the tabletop and shelves are made with beech colour bamboo, which is not only environmental friendly, but also an extremely strong material. Extremely Stable- Simply twist the adjustable feet in and out, to accommodate your counter on any uneven surfaces. Easy Assembly- Meas can be done in four simple steps. Expand your frame, attach the channel bars, wrap your graphic around the frame and lastly, place your table top of the hubs and the shelves onto the frame. The tabletop has carved with slot, which let it sits firmly on top of the hubs. 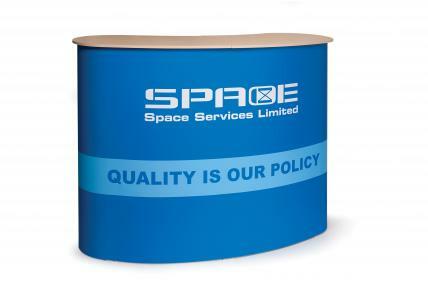 Highly Portable- With our specially designed wheeled carry bag, everything including graphic, can be packed away once your presentation has finished.